There are a lot of teams and athletes who put time and effort into community outreach, that's not always recognized by the public. At SquadLocker, we are dedicated to forming partnerships with local organizations and non-profits, especially when it comes to our relationship with the J. Arthur Trudeau Memorial Center. The Trudeau Center is a non-profit center whose mission it is to provide their members with developmental disabilities an enhanced quality of life. Last summer, SquadLocker president Todd Grant spearheaded a unique community project with the Trudeau Center, which allowed us to create jobs for the Center's members and an opportunity to learn a new skillset. 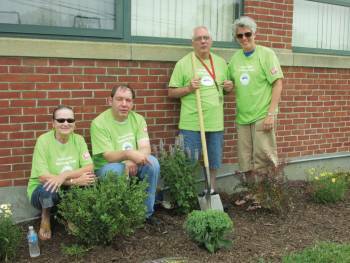 What started as a community outreach partnership has since turned into a "beautification" project. The Trudeau Center designed all of the landscaping, planned the project execution, selected shrubs and flowers to plant on the SquadLocker grounds, and returned to SquadLocker weekly to maintain the garden and keep the plants healthy. While the project began as program to help the Trudeau Center members, we are excited to report that we'll be collaborating with the Center this summer to expand our efforts and turn the project into a community outreach program. This year, the folks from Trudeau have planted a vegetable garden on SquadLocker soil, the proceeds of which will be donated to local food pantries throughout the state. Pete Fontaine of the Warwick Beacon wrote an excellent article that highlights this partnership in more detail.